The problem is their human rights record. As I wrote about on this site, the UAE had detained Matthew Hedges, a UK grad student, for months, sentencing him to life in prison before deporting him; they claimed he was spying for an unspecified party. The UAE also has a history of detaining Islamic activists it accuses of being tied to the Muslim Brotherhood or “extremist groups,” as I discussed in my book. Additionally, there have been some troubling reports of discrimination against Christians on inheritance issues, with some, like Nina Shea, questioning the UAE’s “tolerance agenda.” And as I sat down to type this post, I saw the news that the UAE arrested a British man for wearing a Qatar soccer jersey. 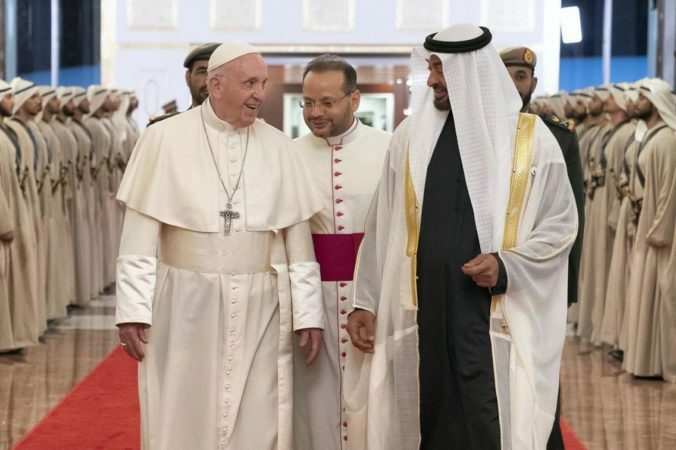 So there’s a concern that Pope Francis’ visit will highlight the positive aspects of UAE policies, distracting criticism from its rights record. To his credit, Pope Francis has criticized the humanitarian crisis in Yemen (which UAE military actions have contributed to). But he also has a history of downplaying contentious human rights issues for the sake of dialogue, as occurred during his trip to Burma. There are two ways to defend Francis’ trip. One is the value of engagement. Yes, naming and shaming is satisfying, but it can shut down the audience you’re hoping to influence. Instead, patient engagement can have more substantive, if more subtle, effects. As I’ve discussed elsewhere, this model–typified by groups such as the Institute for Global Engagement–have led to results. Another defense is the value of religious freedom. Some refer to this as the “first freedom,” and argue all other freedoms flow from it. So engaging with the UAE on religious freedom can lead to broader political reforms even if we do not address them directly. If the goal is patient engagement, then I applaud the Pope’s visit and the accolades it has received. But I worry we may run into a tendency to isolate religious freedom from broader rights issues. That is, as long as there is some progress on defending Christians and combating “Islamic extremism” religious freedom advocates may look the other way on human rights in the UAE. As I’ve noted, there is a tendency to do so already among international religious freedom advocates–witness their praise for the repressive regimes in Egypt and Saudi Arabia. I sound overly critical of the UAE, but I honestly believe they may care about promoting interfaith dialogue. The problem is, the model for doing so flows through the UAE state, which can cause problems for those who oppose it (or are just caught up in its paranoia, like Hedges). I hope the Pope’s visit helps, rather than contributes to, this situation. IMO this visit only helps maintain a false narrative in the mainstream Western mindset that certain vile regimes – such as Saudi and the UAE – are ‘good’ Muslims while doing little to reverse generalised Islamophobia. I really doubt that dialogue is what’s needed when these regimes have been so long sheltered from criticism in the Western media which simultaneously decries others that are often similarly or even less repressive. I feel one thing you don’t address is how diplomacy of this sort can quiet the surface-breaking questioning of arms sales by Western allies to these grotesque regimes.